Spiderwebs can withstand a predator's impact while still helping catch and detect small prey. Spiders architect these lightweight networks for strength and elasticity using different silks and geometric structures. Recently, researchers unraveled a new energy absorption mechanism that explains how spiderwebs can be simultaneously sensitive and impact-resistant. The research team reports their findings in Applied Physics Letters. Spiders harmonize spiral and radial silks to enhance their web's absorption ability. Spiral silks are soft and stretchable, whereas radial silks are usually stiff and uniform. The researchers found that spiral silk features a distinct gradient variation along the radial spokes that extend outward from the center of the web. Their results also show that because of the silk's optimal mechanical properties, a spiderweb can exhibit near-uniform energy absorption at any point on the web. Existing research compared the structural and material differences between webs to explain varying levels of energy absorption. 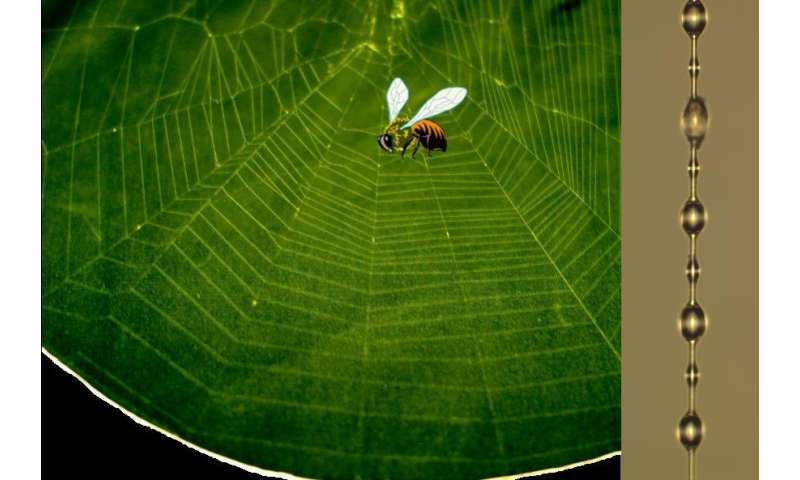 Here, the researchers analyzed the web's material properties to understand how the interplay between different silks and geometric structures affects energy absorption. This is the first work that evaluates the differences among spiral silks across the same web. The findings show that the gradient variations in spiral silks are significant and repeatable, regardless of the thread thickness, web dimension, or characteristics of the individual spider. First, the team raised orb-weaver spiders in their lab and developed special wooden frames to contain and collect web samples. The researchers secured the web samples to prevent deformation and examined the spiral silks under an optical microscope. Once they obtained the diameter of different silks, the researchers performed uniaxial tension tests to determine the silk's varying strength and elasticity.The researchers also measured the number density of the glue droplets that form on the spiral silk as the web is constructed and connect the silk spokes. According to Xi-Qiao Feng, a professor at Tsinghua University in China and an author on the paper, the team ultimately discovered that "the spiral silks feature a distinct gradient variation in the tensile stiffness along the radial direction of the web. Due to the gradient variation in the properties of spiral silks, the web exhibits a nearly uniform energy absorption ability, regardless of the position where a flying prey impacts on the web." Going forward, the team plans to investigate the striking dynamic behaviors of spiderwebs during capturing. Furthermore, the principles gleaned from spiderwebs could offer insights to designing impact-resistant structures or future land, air and naval vehicles.